“This Lucky Deck is a custom deck of playing cards. It came together in a desire to utilize the card design process that gave birth to our current decks of playing and Tarot cards, and apply it to the creation of an original, progressive deck. The result is a unique pack that is appealing to playing cards collectors, as well as intriguing and entertaining to play with for everyone who loves beautiful playing cards. The deck keeps the structure of the regular pack of 54 cards with 4 custom suits (Fleurs-de-lis, Stars, Shells and Spirals) and two jokers. The face of each card is illustrated with archetypal images made with Victorian engravings that will reverberate as meaningful for the 21st card aficionados. 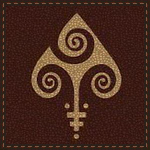 The deck can be used to play common card games as well as other past-time such as magic tricks and possibly fortune-telling. 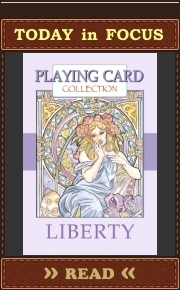 The cards measure 2.75″ x 3.75″ (traditional poker size) with rounded corners. They’re professionally printed on 320 gsm Casino quality smooth finish paper with patented UV textured coating, perfect to shuffle and deal. 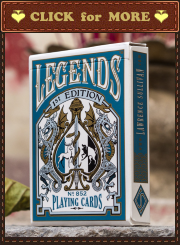 It come neatly packaged with a little white book outlining a brief history of card design as well as insights about the inspiration behind this true novelty deck.